As a professional blogger with a healthy client list, I’m pretty busy. That doesn’t stop me from scanning the job ads occasionally, just in case a dream gig for a dream client comes along. (Hey, it’s happened before, so it could happen again!). The trouble with job ads, though, is that they are full of the latest business and marketing buzzwords. You know the ones: people wanting posts that are “data driven”, writing that “pops” and, my pet peeve today, content that shows “thought leadership”. Jargon has its place, but often it’s just empty, and there’s no reason to use it. That’s the case with most uses of “thought leadership”. 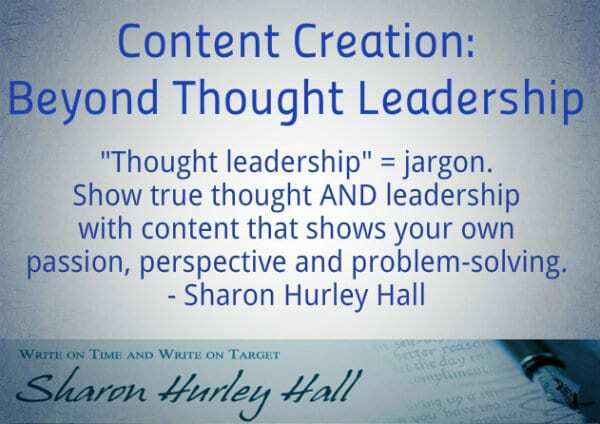 The term “thought leadership” was used in a book by Joel Kurtzman in 1994, though the practice pre-dates the book by a few decades. Recently PR, marketing and branding specialists have co-opted it as a “good thing” (which is probably why it keeps turning up in job ads). Can a Writer Make You a Thought Leader? But more than that, the people looking for outsourced writers to create “thought leadership” content have no idea how big the ask is. How is someone else going to have an original thought about your business? How can any writer know your business better than you can? Short answer: they can’t. 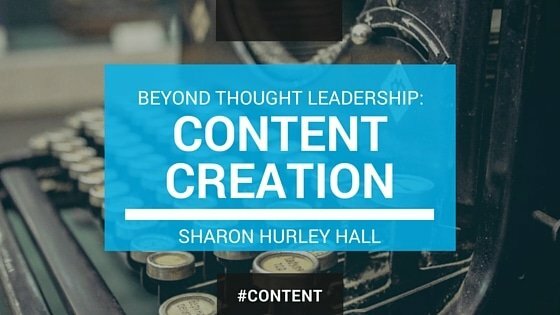 Yes, writers can create excellent written content, but while many writers are versatile, they can’t think for you. Thought leadership is about authority, about providing a new perspective on an issue, about attempting to solve issues, about showing your passion for a subject. Passion and expertise make people take notice. Unique viewpoints and true problem solving make people take notice. Maybe we should call it “thought provoking leadership” instead – making people think differently about an issue they might otherwise have taken for granted or ignored. As the Financial Post says: “True thought leadership isn’t something your public relations team can create or carry.” That goes for your writer too. Sounds like the proverbial “think tank” to me. Remember when that one was floating around? LOL! LOVE this! “Maybe we should call it thought provoking leadership”. Slam dunk! I’m amazed that people would think they could hire out their “thought leadership”! I’m with you, thought-provoking is a much better aim. Believe it and weep, Tea – never fails to astound me! I’ve had to tell a few clients exactly what you’ve stated: they know their businesses better than I do and the “leadership” for writing something coming from them had to come from them. A jargon busting mission? Glad you chose to accept. Thanks, Vernessa. I have that conversation often. On the flip side, when you work with someone who gets it, it can work well. If a client gives his unique take on an issue, then I can flesh it out into a well-rounded piece. Sharon, I blame Internet Marketing Gurus. LOL. No, it’s my fault for believing the the idea that – somehow – Google and content producers = easy sales. I think you understand me. The authority-site-as-bludgeon to corral all that traffic Google sends? Well, that concept wasn’t a “thing” when I first started. Back then, it made sense to me that outsourcing sales letter copy was the way to go. Exactly, Mitch! But if you DID want to work with a writer, I’m pretty sure you’d do it on a collaborative basis. That is correct. I’m all about collaborations. 🙂 I’ve worked with your team, Vernessa, and several others over the years. Indeed you have, Mitch. I still remember your networking post from WritingUp days – a lot of good sense there about community. I have to thank face-to-face networking luncheons for many of the insights. Speaking that, your article would apply to the presentation crowd, too! I can still remember random individuals who stood out at those meetings. They didn’t try to sell anything: they shared their knowledge. Totally agree that it’s often used as a vapid excuse for having nothing better to say! I love what you said about thought provoking. Now maybe someone is going to co-opt that and before you know it, you will have invented your very own buzzword! LOL – oh no, stop the rot now, Carol-Lynn! Great post Sharon! I say take the pressure off. Stop holding yourself to the idea of being a “thought leader”, and just be YOU with your unique ideas and je ne sais quoi! No thought leader became so because they woke up one morning and were like: You know what, I’m going to be a thought leader today, watch out world. Never happened. They just did it. Wow Sharon..I had not thought about it that way before and I thank you for choosing this topic for the carnival excellent. I absolutely love “thought provoking leadership” – talk about a full description that you can touch and feel that removes any and all questions. I think Carol is so right…people really don’t have much to say or don’t know how to say it so they use something they see as a buzz word vs. taking a risk and creating their own..I so appreciate your “thoughts” on this post….You are da bomb! I totally agree with what Mitchell says above: File under meaningless jargon invented by internet marketers to make themselves sound cooler, smarter, more successful, more like they know what they’re talking about, etc. If I see a job ad that says that, it says to me: “I want you to figure out my business for me.” There’s too much of that.